Now, I don’t want to belittle Russian interference in our election, or Mueller’s investigation, or any tie between the Putin government and Trump. But Russian conspiracy Twitter, populated by the likes of Mensch, Garland, Taylor, et al, is outside the scope of respectable inquiry. It’s like comparing NASA to the flat-earth society. 1. There was a plane crash. 2. On board, there was a Russian. 3. The Russian had some connection to Kushner and Trump. 4. By implication, the crash was no accident, and was designed to kill the Russian. The dude he is talking about wasn’t even on the damn plane. Apparently, he was taken in by a 4chan hoax. 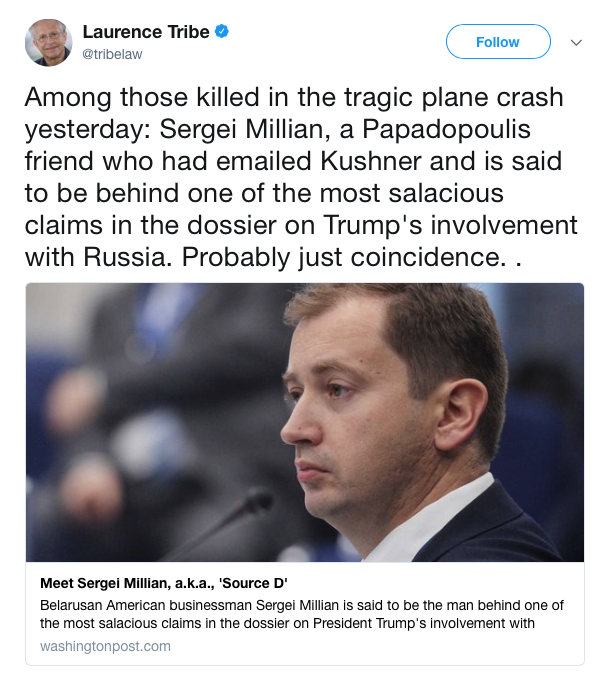 Even if Millian had been on the plane, casually suggesting that Putin, Trump or some combination of other villains purposely murdered everyone on the plane in order to silence one witness is deranged to the point of being a clinical pathology. That sort of baseless conspiracy mongering ought to disqualify anyone from serious company for a long time. Tribe has gone from respected law professor to conspiracy-spreading crank in almost no time at all, and as Greenwald points out, our system is so screwed up that it’s actually rewarded him—he’s gained followers galore among the #resistance lunatic fringe, and he’s a frequent guest on MSNBC. In a just world, this would end with public humiliation of the kind from which Tribe would never recover. (His retraction was laughably insufficient.) In our world…well, he’ll probably just dust himself off and get to work on his next theory about how the moon is a Russian plant designed to spy on American nuclear facilities. Or something.